We are a distinguished name of this arena, engaged in bringing forth an outstanding array of Die Press Starch. Manufactured by our professionals in adherence with the international quality standards, these press tool dies are available with us in different specifications. Our tools are highly appreciated for their durable finish, sturdy construction and application specific designs. We provide total designing solutions to our customers, which extend to manufacturing dies on a turn key basis. 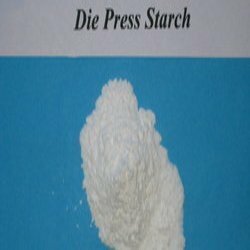 We are a leading name in this domain engaged in manufacturing and supplying a broad array of Die Press Starch. It is a multi purpose product in that it can also be used as a disintegrating agent and as a binder in the form of starch paste.Consequently it is exceptionally adaptable in tablet and capsule formulations and widely accepted as a multipurpose recipient in all solid dosage forms. In Capsule filling operation on high speed capsule filling machine to reduce rejection level.